Being from Scandinavia and doing business with any North East Asian company will certainly make you notice some cultural differences. One of the moments I remember was the first time visiting a customer in Imabari, Shikoku Island, Japan. 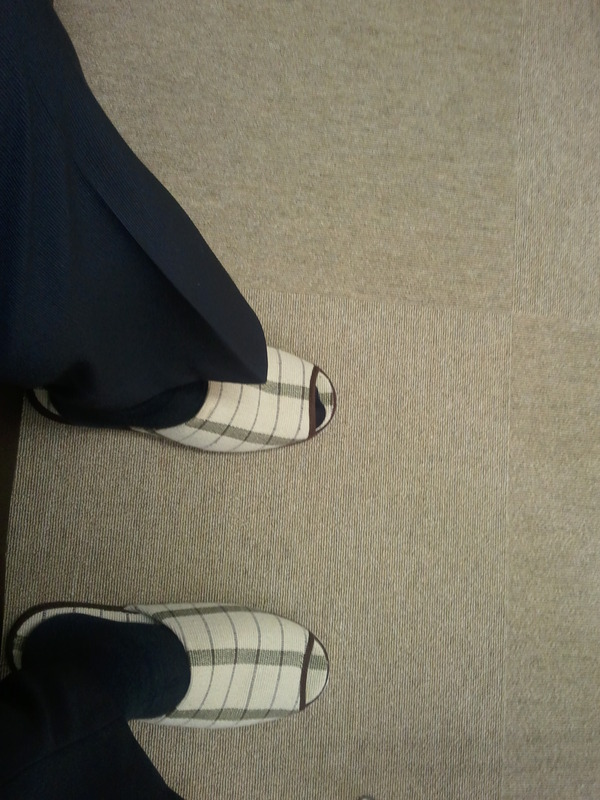 Here I was asked to take off my shoes and wear the office slippers. I guess this may happen from time to time in Japan, but this, the first time, was just “interesting” to me. This entry was posted on October 27, 2012 by kdawikstrom. It was filed under Japan and was tagged with culture difference, Foreign, imabari, Japan, Photography, postaday, shikoku island, slippers, Travel, weekly photo challenge. Hahaha ! This anecdote is awesome. In France you only take your shoes off in houses of people who are obssessive about tidiness ! ewwwww! other people wore those slippers??? and worse…what if the slippers don’t match your chosen wardrobe that day! (I’m serious! I always match my shoes and handbags before leaving the house!) Can you bring your own work slippers? Slippers? Awesome. I want to wear slippers at work. I think they match the floor quite nicely. Good shot and great interpretation of the theme. Hahah, yeah, slippers would be awesome to wear at work every day! Thanks! The banner photo is from the Eastern part of Hong Kong Island, looking in to the Western part of Hong Kong and Kowloon. Quite a skyline. At least your feet fit! Mine don’t. Hehe, that can be a problem! Amazing place, Japan …. was there quite a lot in the late 70th. I totally love Japan. Just wish I could go there more often. I do too – but I haven’t been back … if I win the lottery I will go straight away.